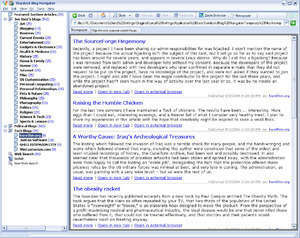 Blog Navigator is a freeware RSS reader that makes it a snap to keep up with what's happening on the net. It supports any number of RSS feeds and can be set to download and archive different feeds for off-line read (great for those who travel a lot). It also integrates seamlessly into the various RSS search engines on the net allowing users to create their own custom blog feeds based on key words. For security reasons, you should also check out the Blog Navigator download at LO4D.com which includes virus and malware tests. Additional screenshots of this application download may be available, too. 4.8 out of 5 based on 67 ratings. Blog Navigator has a presence on social networks. Blog Navigator download been highly rated by our users.